Governments and Kings before them for centuries have been able to run administration through efficient use of taxes. But taxes are also a friction for business which generally entails that they will go to any extant possible to avoid getting taxed. Apple, Microsoft, Google among other Tech Giants, to escape the clutches of the US Tax Administration have for years sold their products outside the US by routing it through one of the many tax havens / low tax countries. Apple for example has 94% of its total cash outside United States. Only after the recent tax cuts announced by Trump have many a company announced their intention to bring back the corpus in the light of the new lower tax regime. India at one point of time had a tax slab which taxed income at 85% in the year 1970 – 71. From that point, we have come a long way but given the high incidence of Indirect taxes, overall tax impact remains high. The social mind set thought of gains being accrued by businessmen without effort hasn’t gone away despite 3 decades of liberalization. Post the 2018 budget when the Government announced Long Term Gains from Stocks would be taxed at 10%, the Finance secretary Hasmukh Adhia commented that “Capital gains don’t accrue from any effort”. In his view, very fact we are taxing capital gains at just 10% versus the highest slab of Income tax being 30% is something that needs to be looked at favourably. Generating capital gains from stock market is neither easy nor effortless. Even before the implementation of the Long Term Tax, we had multiple other taxes that are levied on those trading the stock markets and this was one more addition to that list. While we Indians have no option but to grin and bear each and every additional tax that is levied by the government, those outside India are neither interested in grinning or bearing the taxes. While access to Indian Markets is easy compared to earlier times, smaller players were unable to participate. With an intention to provide players elsewhere the opportunity to trade on the Indian Indices, the stock exchanges has entered into agreements for trading derivative products on Nifty 50 with Singapore Exchange Ltd. (SGX), Chicago Mercantile Exchange Inc. (CME) and Osaka Exchange Inc. (OSE), Taiwan Futures Exchange (TAIFEX). Singapore, Cyprus and Mauritius were tax-safe for Indian investments till recently. Investing in Indian stocks or derivatives from any of these locations allowed foreign investors to get all their gains without paying any Indian taxes. But recently, the government has renegotiated the treaties and will start imposing taxes on the gains made by them, with a smaller amount now and full taxes after March 2019. With longer trading hours and lower taxes, Singapore emerged as a frontier for finance in Asia and it was no surprise to see volume of transactions on Nifty 50 pickup tremendously. So popular was the contract that SGX derived nearly 10% of its derivatives revenue from just trading Nifty 50. And, of the total Nifty derivative volume, there was as much being traded on the SGX as there was on the NSE. Note that Singapore charges no capital gains taxes, so anyone buying the Nifty there is more advantaged than buying it in India. But there were stock futures! Stock futures are relatively more liquid than the cash market, but give you no access to voting rights or dividends. However, they have lower settlement risk, do not require you to transfer shares, and can be entered or exited relatively fast. While stealing away a large part of Nifty 50 volumes to its side was a pain but one still acceptable, when SGX decided to introduce individual stock futures, it was the last straw on the camel’s back and the exchanges panicked. In their panic, they turned towards the one thing they felt can unsettle SGX – cancelling the license to use Nifty 50 which is a trademark of the National Stock Exchange. The Nifty 50 is a brand, the fact remains that those trading the product least care about the name – it’s the underlying index that is the reason for them to trade. You could call it the Mitron-50 and yet trading wouldn’t diminish an inch. SGX has now chosen the later path – it will call its Nifty 50 Derivative Product as an India Index while basing it on Nifty 50 and using Nifty 50 closing price for settlement. The NSE can stop them using the name “Nifty”. But they can’t trademark the price as which the index closed. And that is all the SGX needs! With one move, SGX has ensured seamless continuation for the product while also saving up on the License fee it was paying ISSL, which is the Index company of NSE. They’ll use the price of the Nifty, but call it the India Index and allow derivative trading. You can buy that index and, on the same expiry date as the Nifty, you will be able to settle it in cash with the price of the Nifty. The same thing, without the licensing fee. Don’t Rock The Financial Boat? Thanks to technology, trading has become Universal. One can trade any market across the world without having to move from his seat. Given that luxury, why would anyone want to shift to places (as this move evinced to GIFT city) is something that makes little sense. China is trying hard to make Shanghai the financial hub for Asia, something that is now shared or rather competed between Tokyo, Hong Kong and Singapore. London used to be and continues to be a Financial hub for Europe, but the impending BREXIT has put a hold on the future of London as the place to do business. The BSE despite all its efforts has little to show in the Derivative markets since Liquidity begets Liquidity and there is no reason to chase Liquidity in exchanges where it cannot be found even if it was a bit cheaper than elsewhere. India can try to attract back the volumes that have been lost elsewhere by simplifying red tape as also reducing the taxes. Higher taxes have always meant an arbitrage and those who are in a position to take advantage of the arbitrage will never sit tight. Worldwide, it’s accepted that if a foreign entity has capital gains in your country, you don’t tax him – his home country does. If you as an Indian resident invest in the US, it won’t charge you taxes on capital gains, but India will tax you. But India taxes foreign investors’ capital gains in India – which obviously hurts them. And if someone like the SGX offers them the Indian index without needing to pay Indian taxes, that’s a good choice to make. 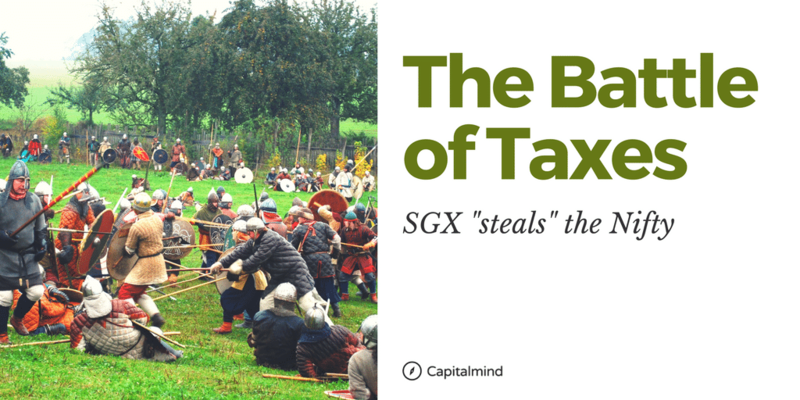 For now, SGX has won his round of the battle. Given International Law, it’s unlikely that NSE can force SGX to withdraw from their current decision. But if and when India lowers taxes, opens up more hours for trading, and reduces effort for participation, there is no reason why someone will prefer to trade elsewhere when the major volumes are in the exchange that it trades on. Rocking the financial boat by introducing taxes will, over time, force people to move to alternatives that are tax free. The SGX just made itself an alternative again, even if ethically outside the line.